"...sweetly singing o're the plains." Do you like angels? I've met some people who seem to adore them, and I must confess, I don't fully understand. The way I imagine angels, they are either in disguise (as in, they look like regular people and we aren't aware of their true identity), or they are suddenly there and telling you not to fear (as in, they're gonna need to pick you up off the floor from your terror). Either way, they aren't the figures I want just hanging around all the time. Christmas brings different thoughts, however. 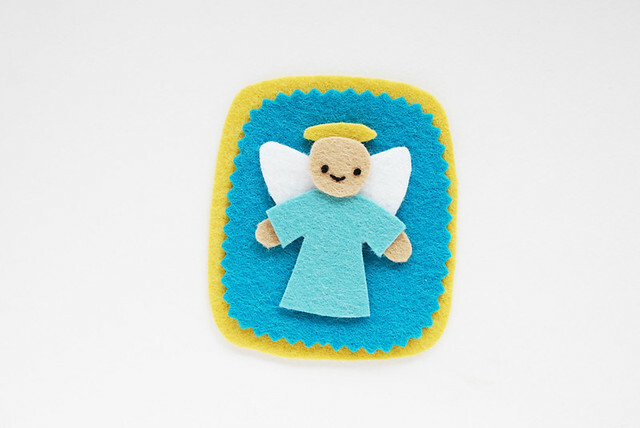 You just can't have Christmas without angels! 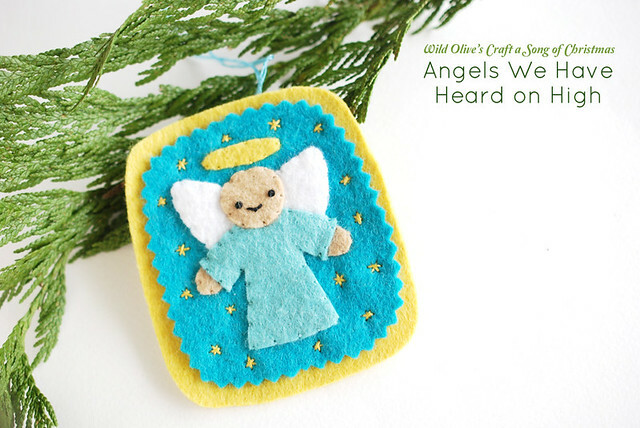 So as we Craft a Song of Christmas this month, I thought I might bring these heavenly creatures to being in the sweet and safe way we like to think of them. With a touch of Wild Olive styling! 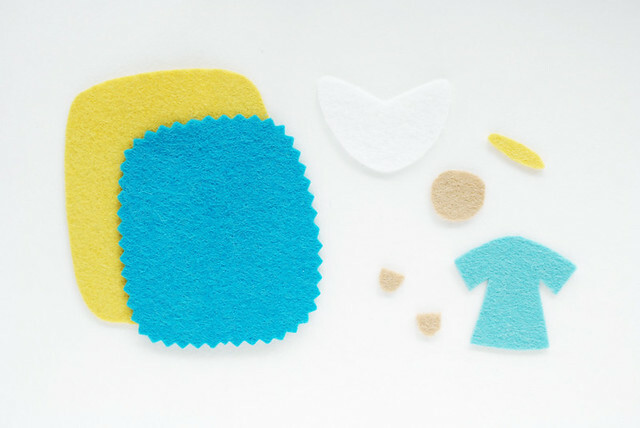 Cut all of the pieces from felt. Use pinking or other decorative scissors for the smaller backing shape, if you want. 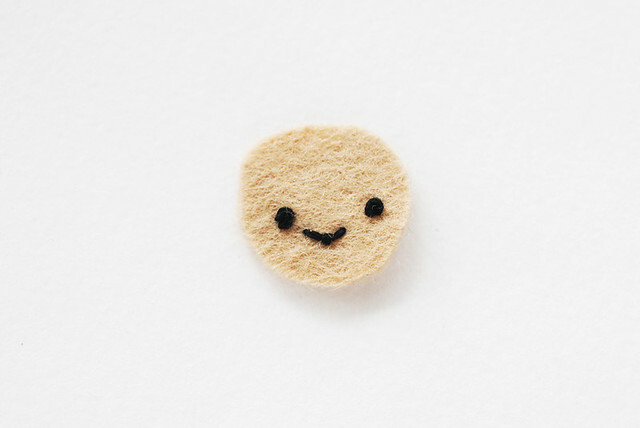 Embroider a face on the head. I did this with three strands of floss. Layout the pieces so you have an idea for where everything will fit. You can adjust this as you go (as I did with the halo), but it helps to place them this way. Stitch all of the pieces in place on the smaller backing, working from the bottom layer up and using two strands of floss to match the felt you're stitching down. You'll want to check the layout as you add pieces, especially so that the hands fit under the sleeves. Stitch the appliqued backing to the larger back piece using star stitches scattered along the edges. 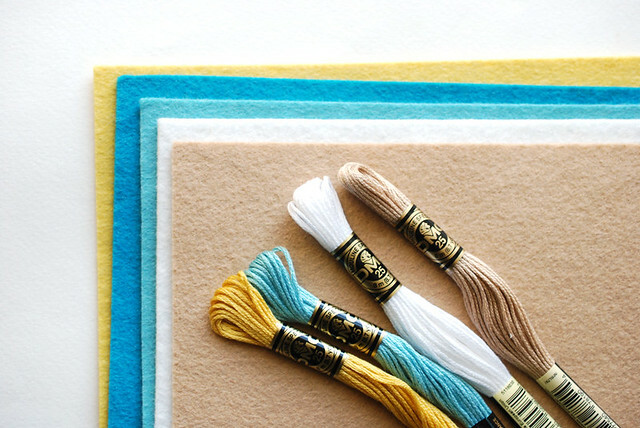 When moving from star to star, run the thread between the layers of felt so it doesn't show on the back. 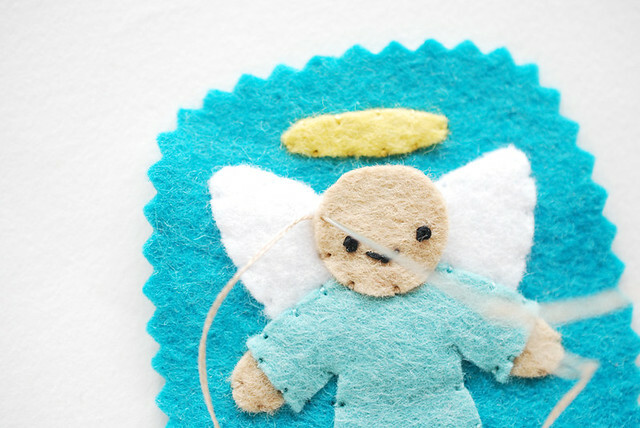 Add a hanger by stitching a length of floss through only the back layer of the ornament. Tie with an overhand knot and trim the ends. Glooooooooooorrrrrrrria! You've got a new ornament! And I've got the chorus of this now stuck in my head. I wonder if the shepherds had a similar experience? Now that we're in the same country, it actually feels like we could hang out! Never mind the several states between us. Have fun crafting and celebrating! Oh, then you must take a short time to make something...anything! I find that a bit of crafting really gets me in the holiday spirit! haha, you are so funny :) I agree, seeing a real angel is something I can pass on. 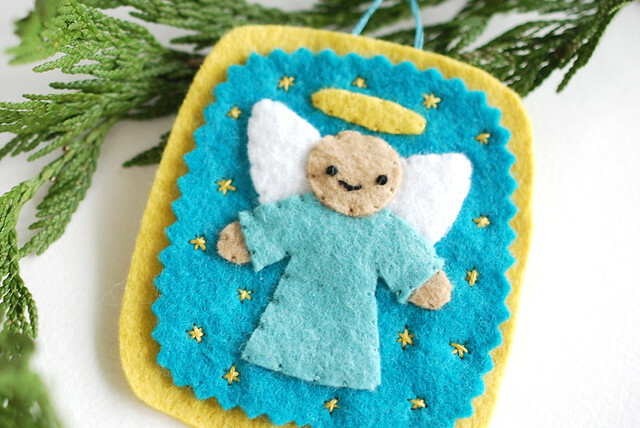 I had a whole list of ornaments I wanted to make this season, but you are seriously tempting me to scrap it and go buy some wool felt instead :) thanks for sharing these lovely tutorials! I always have a whole list of things I hope to make, and then change everything around as the time goes on. 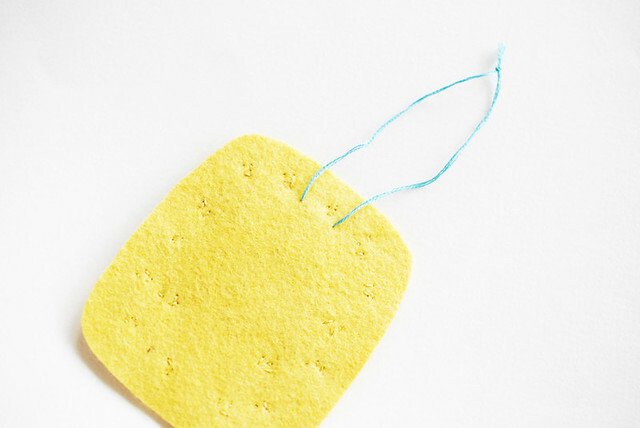 Plus, it's a great way to add to your stash! 'cuz we all need more supplies, right? My MIL is angel-crazy. I think my daughters will have to stitch that up for her! Thanks! Cute. All ready to make this one to go with the Advent. 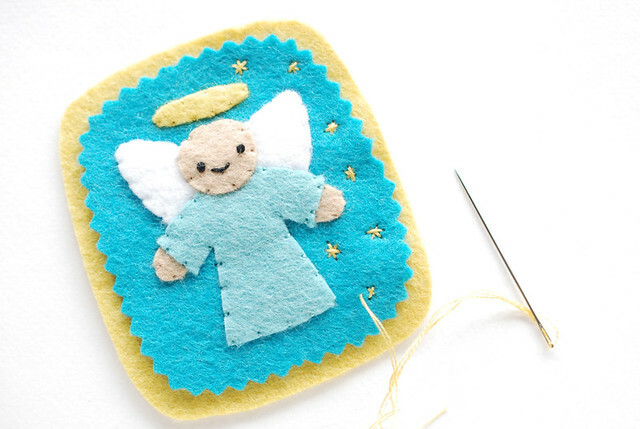 I would love to do a girl angel - Is it the same pattern but in Pink instead?